How fun! Great idea for a scrapbook layout! This is great! Love the shine! Wow..it's really Awesome !! Light up diamond . 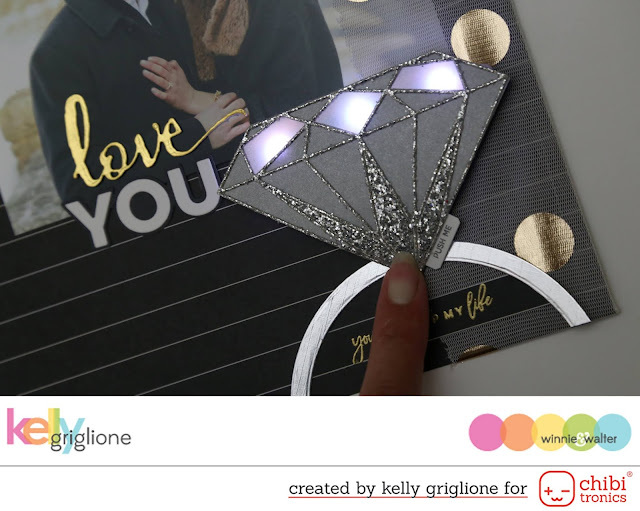 Love your beautiful ring idea. What a lovely layout !! How cool is that! Love your use of the Chibi lights! Love your layout Kelly! Fab design. I have that same Heffy Doodle stamp set, I'd love to have the Chibitronics to go with it! This is such a fun idea! I've never seen something like this before! 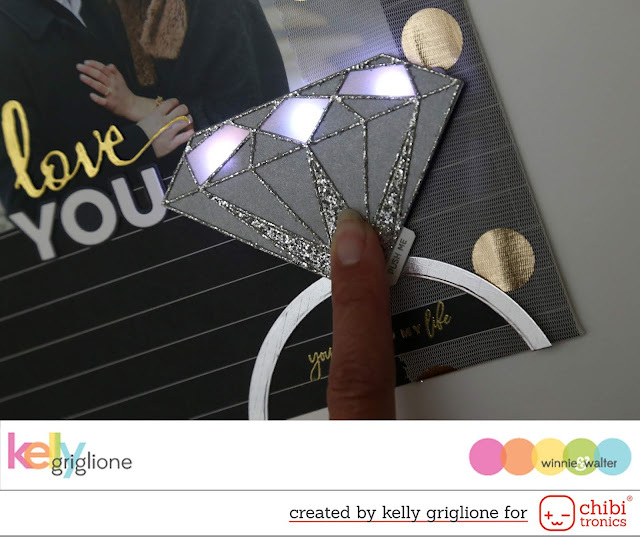 Beautiful card and the light up diamond is amazing! How fantastic! Not only is it a gorgeous layout, but the light-up feature will sure to make this a treasured part of the album. What a fabulous scrapbook page of their engagement. Oh wow, this is so so lovely!! wow what an incredible idea on how to use these fun lights!!! Great idea, Love the ring! Thanks for the chance to win and sharing. This is WOW Kelly... Love it totally. I love blog hops because they inspire me to create--thank you!!! You clever, clever girl, Kelly. This is marvelous. Wow! So creative putting the lights behind the diamond. Hope you frame your creation. You'll have to leave it open so you can press the diamond. It would be perfect to display at a wedding or anniversary celebration. Just beautiful: thanks for sharing! Oh my goodness!! Gorgeous layout and what a way to remember that fabulous moment in time than to have it light up! Fabulous idea for your layout! The lights are amazing! Love the interactive layout idea! So cool and bright! Gorgeous layout with these fab products. Thanks for sharing your creativity.